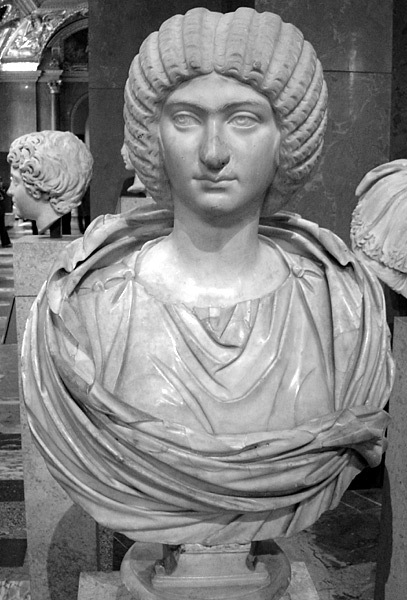 Julia Domna was born at Emesa in Syria, but traveled to Rome as a young woman in 173 AD. In Rome Julia met the general Septimius Severus who was a fanatic about astrology. Upon learning that her astrological chart foretold that she would marry a great king, Septimius decided that he would marry her in 187 AD. Julia became Septimius’ second wife. In 188 AD she bore him a son who would ultimately become the future Emperor Caracalla. The following year a second son was born whom they named Geta. Julia was known to have been a woman of brilliant intellect and great beauty. She often consulted Severus on matters of importance and assisted him in his rise to the throne. Julia also had a reputation for having many love affairs and where her political loyality remained with her husband, in matters of physical relationships she was loyal only to her personal desires. As Empress, Julia brought together the finest minds and philosophers of her time. Among her most famous guests were Galen, Philostratus and Ulpian. However, Julia found her influence over her husband began to subside as Severus looked toward his Prefect of the Praetorian Guard, Plautianus. Julia, as well as her son Caracalla, resented Plautianus’s influence (200-205 AD) and Julia feuded bitterly with him at court. Unable to defeat him, Julia retired to a life of philosophy and study, returning to her influential position in 205, when Plautianus fell from his office. Julia’s dominant character, a trait among most women in her family, did little to solve the bitter childhood disputed between her two sons. Upon the death of her husband, both Caracalla and Geta were made joint Emperors. This proved to be a situation that Caracalla did not wish to tolerate. Julia tried to solve the disputes between her two sons without success. The palace was even divided in two in an effort to keep her sons apart from each other. But in 217 AD, Julia stoodby and watched Caracalla murder his brother in her personal apartment and Geta died in her arms. Following the murder of Geta, Julia found her influence to be seriously lacking when it came to dealing with her insane and vengeful son Caracalla. Nonetheless, Julia continued to take part in government, advising her son whenever possible. In 217 AD, she was at Antioch in Syria when word came that Caracalla had been assassinated and that Macrinus was now emperor. Julia either died naturally or killed herself by a voluntary abstinence from food. 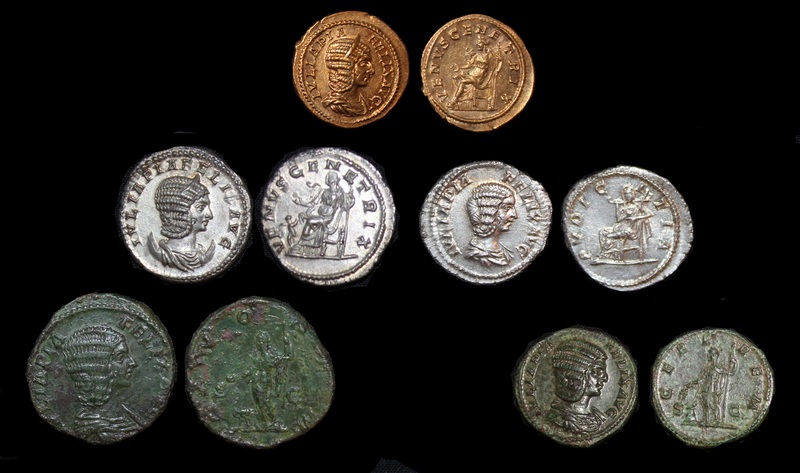 Julia Domna’s sister, Julia Maesa, eventually instigated a revolt in Emesa against the usurper Macrinus in favor of her grandson Elagabalus in 218 AD. 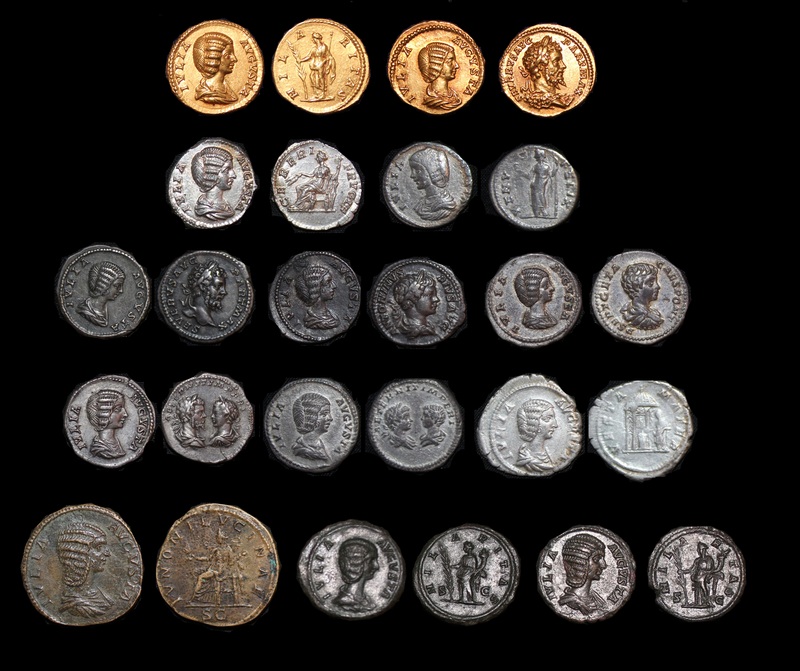 The monetary reform carried out by Caracalla with the introduction of a double denarius and a double aureus is also evident in the coinage of Julia Domna, but is naturally far less common.